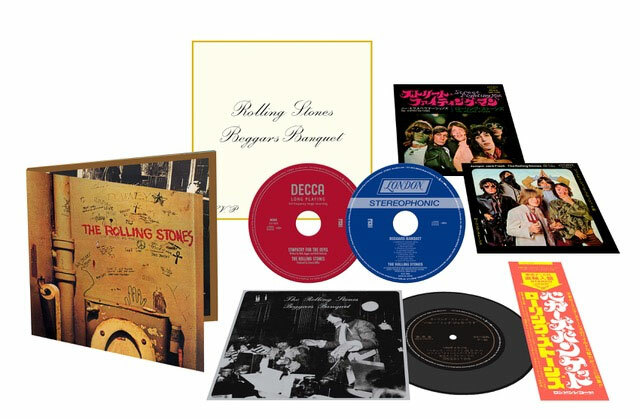 Physical media is not dead and ABKCO is proving it by releasing a double hybrid Super Audio CD (SACD) edition of The Rolling Stones’ Beggars Banquet (50th Anniversary Edition) on December 7th. The limited edition release comes on the heels of the November 16th domestic release of the same project on CD and limited edition 180-gram vinyl LP. The SACD package itself is designed to look like a miniaturized replica of the 12” gatefold double-vinyl edition, sized to be a convenient 7” gatefold, and contain two hybrid SACDs, a flexi disc and expanded packaging elements exclusive to this edition. This bespoke packaging is manufactured in Japan and is of the highest quality to match the SACD audio. Special elements of the package include: replica packshots of two Japanese 7” single picture sleeves (“Jumpin’ Jack Flash” and “Street Fighting Man”) and both versions of the Beggars Banquet sleeve art are included. This SACD set is a Japanese release, which will be imported into North America in a limited quantity. The news comes as the group teases new music and a possible return to the United States for a tour. The group has published an animated video clip on social media of the Statue of Liberty with the group’s logo rising as the sun, teasing fans a US tour announcement is imminent. More details as they become available.